Red and white, blue suede shoes, I'm Uncle Sam. How Do you DO? Just a quick note on wood types for whittling. 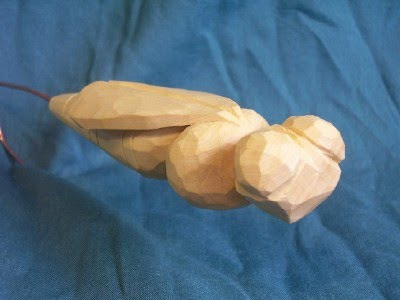 Most common is probably Basswood, it's readily available relatively soft yet hard enough to hold details well. Close in the running would be walnut, butternut, mahogany, willow, Paulownia, cedars including spanish cedar and maybe pine. (I probably missed a few). Paulownia reminds me of balsa, amazingly light. One of the members of the Whittlers porch uses it almost exclusively, he likes the light weight for Christmas tree ornaments, he has a good point it is light. The others are a little harder, pine has varying grain density that can cause some small issues, the summer rings are softer than the winter rings. It's not on my list of favs. And then we come to Found Wood. Oh Boy. Its just what the name says- wood you just found, maybe in in the woodpile, by the side of the road, at the beach, etc. There are a couple pitfalls in found wood, and some hidden gems too. One pitfall is you don't necessarily know what is in the piece, did that root grow around a stone, or in sand, is there some foreign matter in there that will ruin your day and maybe your knife too? Second pitfall is the hardness- a lot of times you won't know what species you found- I have a walking stick half done that is hard like a rock. It was a sapling, I did not see the leaves, the juvenile wood defies my ability to identify it, but I can tell you it it hand cramping hard to cut. I have heard that dipping hard wood in alcohol (think denatured, NOT your beer) will temporarily soften the wood so you can whittle. Alcohol does not swell the wood fibers like water and should not cause any damage to your work. It also dries quicker than water would. It works, I don't use it in the house because of the fumes. It might raise a little heck with your knife handle if the finish is shellac, watch out. You can always fix the finish if you need to. You might try carving your found wood while green, it will shrink and is likely to crack as it dries. I can promise you it won't shrink evenly, and Murhy's Law says you won't like where it cracks either. Maybe that could fit into your project? That all sounds like a lot of negativity, if a piece of kiln dried bass will suit your project, use it. That brings us to the Hidden Gem factor. The one good reason (and its a doozy) to collect and carve found wood is you can find things you'll never be able to buy. Magnolia supposedly carves well, has unusual grain and or color, but is not commercially available, at least not in my locale. My own collection of found wood has 4 items- some willow taken from the woodpile, big thick chunks of straight grain stuff, along with some wavy grain pieces that suggest a figure (one looks like a penguin). Another item is some sort of swollen mass, probably the tree or bush's reaction to an infection. It's not very big, fist sized, grain looks swirly, and I'm looking forward to what I find inside when I get inspired to cut it. Walking stick 0r hiking staff material I get here in suburbia from vacant lots, along fence lines, or the little space between the neighbors garages. The last item in my found collection is two root balls I found helping my brother in law take out some Yew bushes of some sort in front of his house- they're head size masses of multiple branches and roots all heading in different directions, and the centers of the branches have a nice red coloring to them. I'm not sure if the color will remain as they dry, so far they've been drying in my garage away from the light for a year or two. No inspiration there yet either. Between purchased kiln dried lumber and found wood of unknown lineage we'll put Opportunistically Harvested Lumber. If you see someone taking down a walnut tree, or a basswood tree, grab all you can, wait until after dark if you have to, and dry it your self. It's not that hard, and hey, you can't beat the price or the chance to say you knew your Gnome when it was still a tree.. I wonder where my (fill in the blank) is? I have a friend on the Whittlers Porch (can I call you my friend John? We've never met) whose whittling motto is 'Know when to stop'. One of his mottos anyway. One of mine, seen here recently, is 'Don't be afraid to cut deep'. Both have merit, both help us do our own thing, more importantly they show that we are busy evaluating our past work and striving to improve. Know when to stop- if you cut too much off the the outer shape, you could affect the ability to roll straight. You need to leave a fairly round, flat primeter to help him keep rolling and not fall over to one side or the other. Don't be afraid to cut deep- on the sides. Deep cuts, shadow lines, sharp(er) relief make for a more interesting piece. I think you have to make up for not being able to cut much on the perimeter too. 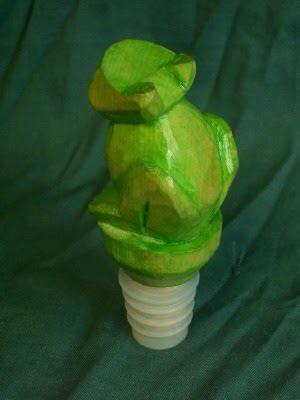 This is actually one you don't really need to carve either- start with a smooth piece of wood, cut carefully, sand the cut edges and ease the corners, and paint the details on, the toy will function and look good too. or your local Rockler store. (Think I saw them on eBay too) They come several in a pack, 6 or ten, and have a wooden dowel in the center of the silicone stopper. You'll need a 5/16 or so hole in the bottom of your whittling blank, and I used Epoxy glue to hold them together. After using the stopper for a bit, the silicone occassionally comes off the dowel, as it is only a friction or slide fit. One of these days I'll slip a little clear silicone caulk in there to hold it all together better. Future stoppers (I still have the rest of the pack left) will get the silicone caulk treatment at the beginning. Before I bought these I bought a fancy chrome one, at twice the price of the pack, only to find out it did n't fit the first bottle I opened. Save your money I say. There is a Carving style out there called Flat Plane Carving, it's really whittling by definition- work is done with just a knife, no other tools, and the wood is held in the hand. There are exceptions- I saw a chainsawn piece that was done in the flat plane style. 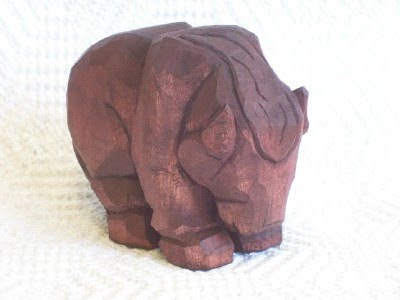 The Woodcarving Illustrated website (link on the right =>) has a flat plane forum, fairly busy with a lot of pics and info available. Take a look. I've had a couple email coversations with different folks about FP, trying to get clear in my mind just what is involved in the style. 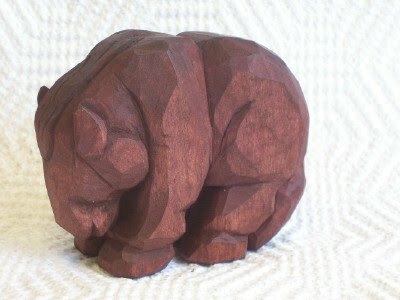 Everyone seems to capitalize the words, the style is held in high regard among many carvers. I won't go into the history of the style, anybody interested can browse the forums or search the web and find the same thing I did. The Little Shavers website (link=>) has some nice pics and some good info). So here's my take on it. It's am impressionistic form in that it does not try to imitate nature as much as represent nature. Most of the cuts will be straight, leaving flat planes of different sizes (hence the name). 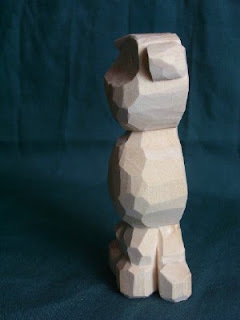 No sanding is done, the more respected whittlers in this style seem to make fewer cuts without sacrificing detail. They also cut more deeply, use sharper angles. The interplay of light and shadow on high and low areas give this style a sense of detail that really is not there. I don't know what a horse's knee looks like, but I know where it goes, and I can cut a couple vee shaped notches that leave a high spot and a shadow line, and everybody knows its a knee. Its a simple style, that forces the viewer to use their imagination. I used the pics of my reindeer, because they are the only thing I have made more than one of. In the first pic, the light deer's feet look to me like footed pajamas. 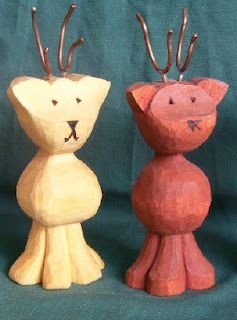 The darker one looks more like hooves. Both still very rounded. The second pic is my attempt to use the FP style on the same item, I like the way the legs look. You can see how light and shadow play with each other, and there is actually more detail to the leg and foot- this guy has ankles and knees the others do not. I was a cabinetmaker for years here on the frozen shores of Lake Erie, in the hiererarchy of woodworkers we considered ourselves second only to the carvers. There is a dirty little secret we kept-our job was simple- we made boxes. Skinny box with rounded corners, countertop. Flat box with legs, table. Box with drawers, box with doors- you get the picture. In my opinion there is a dirty little secret to flat plane carving too. Its quick. 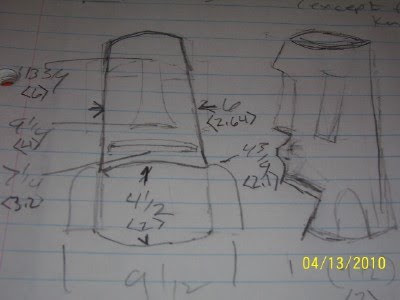 By NOT trying to impart as much detail, by avoiding round surfaces, the project moves along quicker. That's pretty important if your trying to make money. I think the style originated when the carver wanted to create a quick, simple item, for whatever reason. Could have been to help make a living, or to satisfy an impatient customer, like a child waiting for a toy. Straight cuts are easier to do with a knife, especially a working knife or a belt knife- I picture a working man picking up a piece of wood on lunch break, or riding home in the back of a wagon. It would not be easy to cut the footed jammie feet with a belt knife. 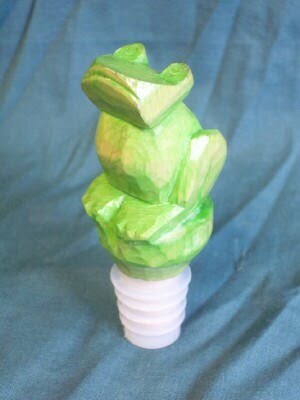 I'm not bashing the FP carvers, many are artists, likely with a little genius included. I'm just calling it like I see it. I will certainly practice the style, maybe not exclusively (I'm not sure the Octopus pen would lend itself to FP). 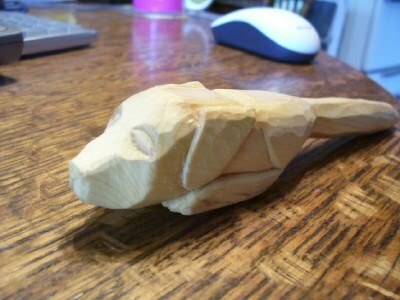 To me whittling should be a little impressionistic, viewers should to have to use their imaginations. 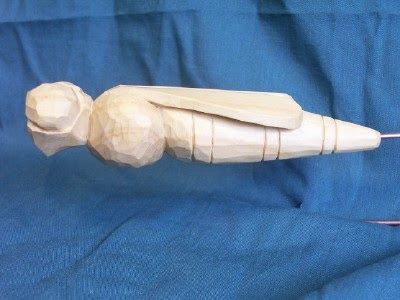 There are a number of things I like about whittling, some of them I have blogged about here. Among them is the opportunity to learn something new. 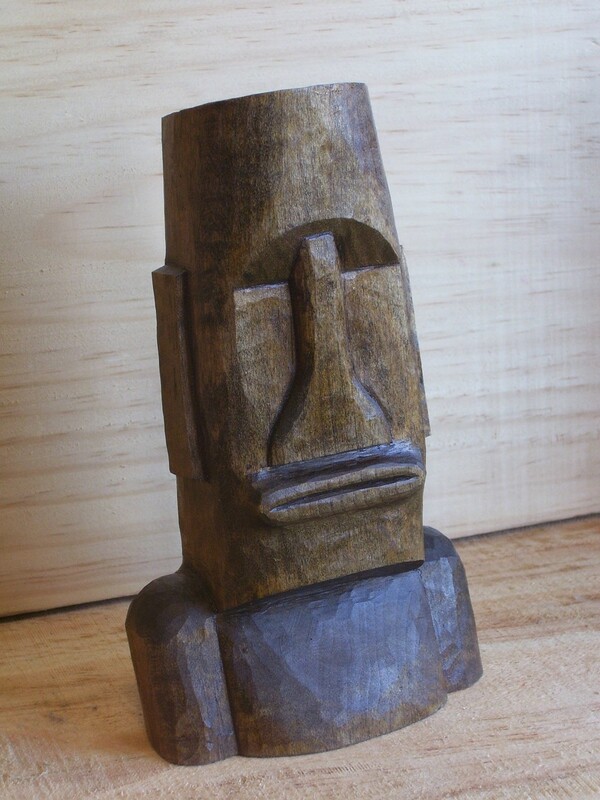 I asked my oldest daughter for a whittling idea one day, and she told me an Easter Island head would be good. We had recently watched the DVD Night at the Museum, and I figured that was her source. The neat thing about DVD's is you can pause them and get a clear picture, so I got out my ruler, some paper,put in the DVD and used the other neat feature- scene selection to cut to the scenes with the talking Easter Island head. Just a quick sketch, some dimensions off the screen to let me scale my final drawing, and a bunch of questions. I couldn't tell what detail there might be on the sides of the statue, they were always in shadow in the movie. Next stop the World Wide Web. There's more, go find it for yourself. "...Ride, boldly ride, the Shade replied, if you seek for Eldorado." I don't know many poems, most of the ones I do know I couldn't post here, as least not in their entirety. This quote is from 'Eldorado' by Edgar Allan Poe. So what the heck has that got to do with whittling? As I write this blog and look at the things I have whittled over the last few years I can see evidence of progress in my work. 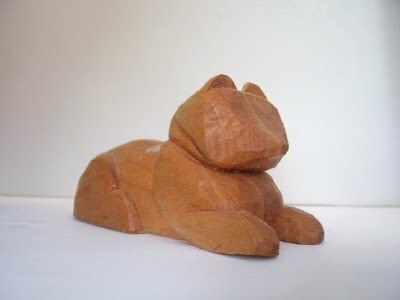 I'm learning as I go, that's what whittling is; I spend time on other sites, looking at other's work, reading blogs about different carving styles, etc. Most importantly, I keep whittling. 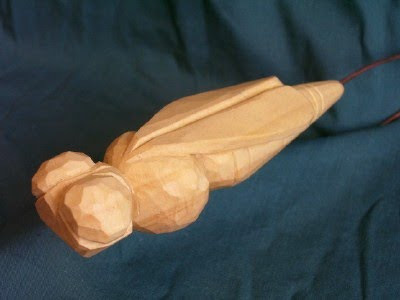 You can learn ABOUT whittling by looking and reading, but you can only learn to whittle by whittling. Comparing my older items like Sphinxcat, with some of my newer ones (and with some of the things I've looked at on the WWW)I can see two things i've done somewhat unconciously. made to stand out more against his body. he was cut from. Both would look better if I had cut deeper, removed more wood. He met a pilgrim shadow. That's true for whittling too- just do it. The more you whittle the better you'll get.